Do you give or take excuses? 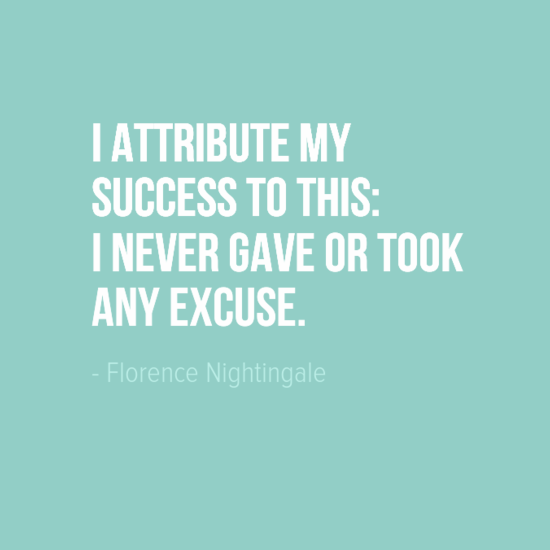 This week we feature a quote from someone who attributes their success to never having given or taken an excuse. Florence Nightingale was born in Tuscany (modern day Italy) in May 1820. In 1837, she underwent the first of several experiences that she believed were calls from God. These calls prompted a desire in Nightingale to devote her life to the service of others. She was further inspired when in 1850 she observed a German Pastor working with the sick and deprived. In 1854, Nightingale and 38 women volunteer nurses that she had trained (including 15 Catholic nuns) traveled to the Crimea to care for wounded soldiers. She identified that the high death rate was due largely to the unsanitary conditions an experience that led her to advocate sanitary living conditions as of great importance. Upon her return to England she founded a Nursing training school and wrote on the subject of nursing. She also produced comprehensive studies on sanitation and was elected the first female member of the Royal Statistical Society.